(Southern Metropolis Daily) The Cardboard Buns Story Was Found To Be Fake. By Tan Renwei (谭人玮). July 19, 2007. The reporter checks the fillings. "Boss, why is there stuff that is impossible to chew?" The waste cardboard paper was being soaked. 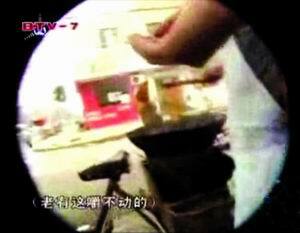 "Most people cannot taste the difference"
On July 8, Beijing TV's Life Channel program <Degree of Transparency> aired the report on "cardboard buns" and gained broad social attention. The Beijing city Industry and Commerce department and the Food Safety Administration paid high attention and formed law enforcement teams to check the breakfast markets in the city. But they did not find any "cardboard buns" at those markets. The Beijing public security bureau formed an investigative team and discovered the truth on July 16. The investigation showed that in the middle of June, a temporary worker with Beijing TV's Life Channel program <Degree of Transparency> named Zi went twice to the number 13 courtyard in Shizikou village, Taiyanggong town, Chaoyang district and asked four migrant workers including a man named Wei to make breakfast for migrant workers. Zi bought some fillings, dough and cardboard paper that he bought himself, and he instructed Wei and others to include the soaked cardboard into the fillings to make the buns. Zi used his own DV camera to record the production process. Then he edited the film and showed the deceptive story. The public security bureau has detained the criminal suspect Zi and will handle his case in accordance with the law. Beijing TV's Life Channel has apologized to society for failing to prevent the airing of a fictive report that has created bad social consequences. 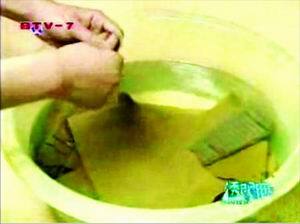 The undercover Beijing TV report about "cardboard being made into buns" created a stir inside and outside of China, but there were skeptical netizens out there. Yesterday morning, a netizen wrote at the Sohu forum that this was a false news report which was manufactured by the reporter. In the evening, the official Beijing news website Qianlong published the report: <"Cardboard buns" found to be false reporting>. The Beijing Times reporter found out that the four suspects who were supposedly making the "cardboard buns" were two couples from Shaanxi, and they sold breakfast in the Taiyanggong area. "They basically did not sell buns." The four have been referred to the Industry and Commerce Department for operating an unlicensed business. As for the man named Zi, he is a main producer/editor with the program <Degree of Transparency>. He had been transferred over from CCTV. He is in his 30's. He does not show up regularly at the office, but he has done some interesting subjects such as "small merchants use pork meat and lamb lard to make fake lamb kebab," "the black-hearted sweet dumplings" and fake vinegar. These reports drew high ratings, and so Zi was a top producer/editor for the program. According to what a Beijing TV worker told Beijing News, the <Degree of Transparency> saw the film that Zi turned in and questioned the veracity of the story more than once. But Zi was confident, and therefore the story was aired. Yesterday in Beijing TV's program <Beijing News>, the TV station admitted that the <cardboard buns> story showed that they failed to review the story and their administrative system came up short. They acknowledged that the report had bad social consequences. They said that they will "pay high attention to this bad incident, draw the lessons and seriously go after the responsible people." As for last evening, the <cardboard buns> video was being deleted from the various video-sharing sites. Many of those links are no longer reachable. 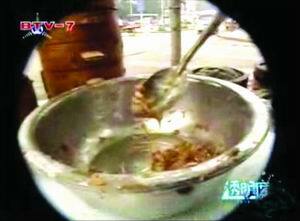 After Beijing TV aired the report, Japanese media hyped it up by airing excerpts and adding some commentary to the effect that Chinese food is inedible. A Chinese student in Japan reported that the story was on Japanese television until an earthquake drew attention away. Before that, the Chinese students were embarrassed about the hyping in the Japanese newspapers and television. In one Japanese program, the host personally tried to make cardboard buns. The paper residuals were clearly still visible in the fillings and they were inedible. Some netizens realized that this fake news report appeared at a time when there is an international confidence crisis about Chinese food safety and therefore it provided ammunition for the foreign media (especially the Japanese media) to demonize Chinese food. "The whole nation was bamboozled, and Little Japan thinks that this is a joke!" wrote Tianya netizen "poloship." On July 10, the netizen "Baizi Xiucai" wrote at the Hongqiao Scientific Forum about <Serious doubts about the veracity of the Beijing TV news report on using waste cardboard to make bun fillings>. Another netizen "Zhimu" wrote a blog post entitled: <Doubts about the veracity of news such as "waste cardboards to make bun fillings">. There were not too many of these doubts on the Internet. But when the official Qianlong news came out, their foresight drew praise from netizens: "You are really smart!" How can you eat something that had been soaked in caustic soda? The spice cannot cover up the taste. How big must a bun store be in order to maintain the normal profits after accounting for the caustic soda, flour, pork and spice materials as well as water, electricity, rent and labor? You must make "at least 1,000 yuan more per day." So how many buns do you have to sell in order to realize that? Is it possible that nobody could taste the difference after so many years? Truth: According to Zi, caustic soda was not used during the filming. The caustic soda comment was added to enhance the audio-visual impact. The film angles did not appear to be made stealthily. Many of the shots came from very good angles. Some of the shots did not appear to come from a hidden camera. Truth: This was not a stealth job. This was a fixed set-up. Throughout the report, the Industry and Commerce Department never made clear what the stall workers did wrong. In the end, the Industry and Commerce Department banned them because they had neither public health permit nor business license, not because they were using cardboard to make bun fillings. There was not even a mention of the term "waste cardboard boxes" from the Industry and Commerce Department. Truth: The Industry and Commerce Department made a sweep of all the conceivable shops and stalls that could be selling breakfasts in the Chaoyang district and did not find anyone using cardboard to make bun fillings. A netizen concluded: there may have been a rumor that cardboard was being use to make bun fillings; the reporter was intrigued; he found a few migrant workers and staged a "news story" in which the reporter discovered and filmed how waste cardboard was being turned into bun fillings. Truth: The netizen's speculation was very close to the results of the investigation. (1) It is unlikely that cardboard residuals could be used in the bun fillings. After steaming, the fillings were loosely packed and did not share the appearance of the tightly packed pork fillings; the fillings seemed impossible to chew; the presence of fiber was clearly visible from the outside. Therefore, consumers will discover the fibers either by taste or sight. It is unlikely that consumers will accept and eat them. (2) The experiments showed that if the pork fillings contain so much as five percent cardboard paper, the human eye can detect the presence of fiber material. Taste tests showed that the buns were impossible to chew.